Cast: Jang Hyuk, Gong Hyo Jin, Seo Shin Ae, Shin Sung Rok and Choi Kang Hee. Min Ki Seo (Jang Hyuk) is an arrogant and cocky surgeon, who also is the son of a rich CEO. He lives every day with only the goal of being the best, until he one day, gets told that his girlfriend Ji Min (Choi Kang Hee) is sick. While visiting her, he finds out that she has last stage cancer, and that she has agreed to accept her fate, but this only furies Ki Seo who decides to take her back home to do the surgery to save her. Unfortunately even he is not able to save her, and this makes Ji Min decide to go to a small island called Blue Island. There she wants to meet a little girl called Lee Bom (Seo Shin Ae), whom she by accident gave HIV, by giving her infected blood. Guilt-ridden she wants to visit Bom and her mother Lee Young Shin (Gong Hyo Jin), and apologize, but dies while riding with Ki Seo. Unable to get over Ji Mins death, Ki Seo decides to quit his job as a doctor and decides to help his mother in business. Here he meets Choi Suk Hyun (Shin Sung Rok), a hardworking manager of his mother’s company. 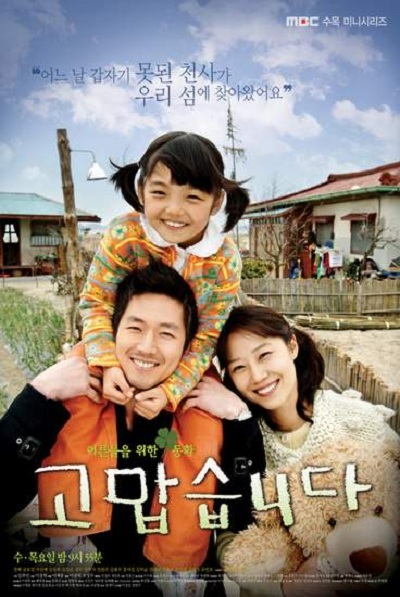 In order to make Ki Seo become good, his mother decides to have Suk Hyun show Ki Seo the ropes, and one of the first jobs is getting all the land from the inhabitants of Blue Island. This is one of the few gems hidden beneath all the idol/pretty actors, with a good storyline and good actors, though it has one big problem: it is way too conservative. I’m not talking bed scenes or kisses, but conservative in the typical Korean drama. And what I mean by typical is the early 20s late 90s Korean drama with the loud boyfriend, jealous ex, overprotective male personas and most of all the long annoying stars with the hints of happy smiles (that take over 2 minutes of the screen time). I was hoping by the end it would change a bit, but it didn’t, so a little disappointed me. On the other hand it has some things that I really like: Young Shin (I know she seems typical but I really found her more amazing than the rest of the female cast), the second female lead actually being nice and likeable and lastly the entire theme of the drama - social discrimination. Me likey! They really go beyond the casual discrimination, by actually talking about fear of the unknown, which by the way is so awesome. Jang Hyuk and Shin Sung Rok are kind of the dull elements here, not because of bad acting but because I dislike ridiculous “jealous in love” characters. So yeah, whatever. All in all a good drama.